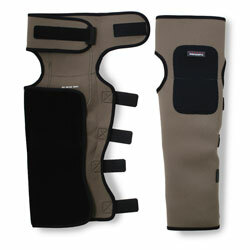 A variety of knee pads are available in the US, but most are bulky and do not fit well. These do fit well and are not bulky. They are constructed of 3mm Neoprene with nylon covering in and out. With five velcro strap attachments, they can be tightened or loosened to fit, and come in a single "one fits almost all" size. The "wader gaiters" offered in the US are generally just gravel guards. These are more like chaps - protecting for your expensive waders from brush and thorns while walking along the trail and from sharp stones while kneeling. They'll also protect your waders from the pinhole leaks you get from your own flies, which is probably a bigger problem than most people want to admit. The manufacturer lists a reduction in water resistance when wading as a major benefit, but I have never felt water resistance on my waders was a major problem. Getting pinhole leaks (or worse) in expensive waders is. The wader gaiters protect your waders. I have friends who had tried for years to get me to try wet wading. I never did, thinking that wet wading was basically wearing shorts, and there too many ticks where I fish and Lyme Disease is not something to take lightly. Oh, how wrong I was! Not about the Lyme Disease, but about the wearing shorts. I tried wet wading while wearing a pair of quick drying nylon trail pants and a pair of neoprene socks. I wore the Wader Gaiters over the nylon trail pants. With the full length pants I was protected from ticks and the neoprene Wader Gaiter and neoprene socks acted like a wet suit. Despite wading in a tailwater, where the water is cold all year long, I was never uncomfortable. I'm not sure I'd try it in January, but during the summer? Oh, yes! I'm now a believer! I have heard it said that the neoprene has to be right next to your skin to keep your warm, but I wore the Wader Gaiters over nylon pants and they worked fine. When you first step into the water it is cold, but it warms up very quickly. The bottom of the Wader Gaiters was low enough to cover the top of my boots so I didn't need a separate set of gravel guards. If you are pretty tall you might need them. You can get gravel guards and neoprene socks anywhere. Get your Wader Gaiters here. I order Wader Gaiters once per year, in the spring. When they sell out they will not be available until the following spring.